Most visitors come to deserts to see large and impressive things, like canyons, sand dunes or flower displays. This page is mostly devoted to small things, although it also contains some flower-covered plains and canyons. Desert photography is relatively easy, because you seldom have to worry about weather or about utility poles in the background. Just take your camera and look around. Shirvan, Azerbaijan Deserts are the last places on Earth where reptiles still rule. You can travel around the world's deserts doing nothing but looking on their faces - and you'll never be bored. This large legless lizard is widespread in Western Asia, its Russian name is zheltopuzik - "yellow tummy". This tiny lizard is the most abundant vertebrate species of Mongolian deserts. In areas with different soil color it can be yellow, grey, black or pink. Dark-purple specimens from black obsidian lava fields are the most beautiful ones. It is active even during the hottest part of the day. Aral Sea, Uzbekistan More than 30 species of this genus inhabit deserts of Africa and Asia, from Sahara to Tibet, as well as the dry bottom of almost extinct Aral Sea. Their name in Karakalpak language means "the tip of your shadow" - they sometimes run for few minutes in front of you, keeping distance of 1-2 m (3-7'). Repetek, Turkmenistan The largest of Phrynocephalus lizards has red "ears" to impress its potential enemies. If the display doesn't work, the lizard can disappear in the sand in few seconds. 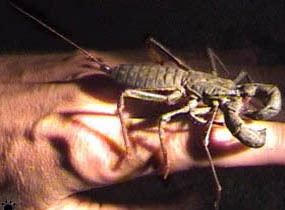 This species is the smallest one, only 5 cm (2") long, including tail. It inhabits sandy deserts and has a lifespan of only one year. 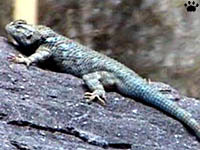 Some Phrynocephalus lizards can be found above 4500 m (15,000') in Tibet - higher than any other reptile. At this altitude, they are active for only 4-5 hours a day, and only 4-6 weeks a year. Repetek, Turkmenistan The largest lizard of Asian deserts is desert monitor (Varanus griseus). It feeds on rodents, snakes, bird eggs and chicks, and young tortoises. Monitors are smart lizards, and they can kill all gerbils in a large colony within a few days. Sometimes gerbils leave the colony altogether if a monitor enters the burrow system. Merv, Turkmenistan Some desert lizards spend their entire life inside small bushes. 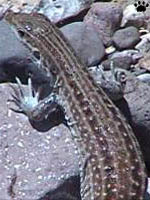 In Karakum Desert, agamas and geckos are the most common bush residents. They are difficult to find, even if a bush is only few inches tall. Ph. cornutum, Dripping Springs, New Mexico. The most bizarre lizards of North American deserts are "horned toads" (Phrynosoma). Once abundant, they are now rare and very local because of illegal pet trade, habitat loss, pesticide poisoning, and because their prey, large ants, is replaced by introduced Argentina fire ants (Solenopsis invicta). Their dependence on large ants also means that they are very difficult to feed in captivity. Of the thousands sold as pets, almost all die within few months. Ph. coronatum, Mt. Diablo, California. Ph. cornutum, Comanche Nat'l Grassland, Colorado. Ph. platyrhinos, El Pinacate Nat'l Park, Sonora. Ph. solare, Tucson, Arizona. These cute and intelligent creatures are known for a number of unique traits, such as their ability to spurt blood from their eyes to repel predators. Interestingly, they are an almost exact (although not life-size) copy of some extinct reptiles, such as a giant Permian herbivore called Pareiasaurus. Ph. douglassii, Zuni, New Mexico. This small snake of Asian deserts lives in bushes, hunting for lizards. It is harmless, but so fast that local Kazakh people believe it can kill a man or a camel by jumping through it. 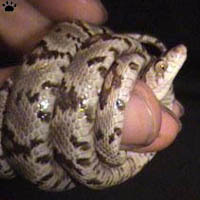 Its local name is "arrow snake". Lyre snake (Trimorphodon biscutatus) and Gila spotted whiptail (Cnemidophorus flagellicaudus), Peloncillo Mts., New Mexico. molossus), Carlsbad, New Mexico. 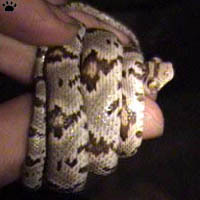 Snakes are common in many deserts, but they can be difficult to find. They often show up for only a few hours a day, when the temperature is the most comfortable. Some snakes spend their entire life underground. Rattlesnakes of North America, left to right: rock rattlesnake (C. lepidus), massassauga (Sisturus catenatus), western diamondback (Hylactophryne augusti), sidewinder (C. cerastes). .
Agadyr, Kazakhstan. Snakes of viper family normally hunt rodents and other small warm-blooded animals, but in deserts many of them prefer lizards, such as this pit viper from Betpak-Dala Desert. 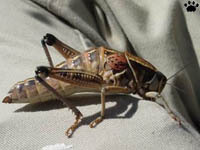 In some years, they don't have enough lizards to eat, so they switch to locusts and jerboas. Ili River valley in Kazakhstan once had the world's highest density of poisonous snakes - up to 100,000 vipers and pit vipers per square kilometer. 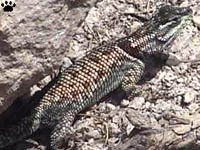 Spiny lizards (Scleroporus) are very common in North American deserts. Left to right: desert (S. magister), Clark (S. clarkii) and mountain (S. jarrovii) spiny lizards, New Mexico. Some places are not normally thought of as deserts, but deserts they are, like most of Galapagos Islands. Naturally, they are also ruled by reptiles, mostly giant tortoises. Here you also find lizards, but some of them dive in the ocean for food! There are also small, less-known reptiles on Galapagos - lizards and non-poisonous snakes. Transaltai Gobi, Mongolia. Many of the most interesting lizards emerge at night. This is a rare gecko from southern Mongolia and adjacent China. It prefers areas with soft soil, and spends ten months a year underground, because it is active only in warm nights which are rare in Gobi Desert. 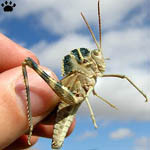 In sandy deserts of western Central Asia and Middle East, it is replaced by more common relative. 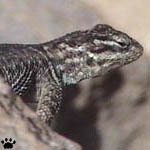 To find this lizard, point your flashlight on sandy dunes late at night. White eyes you'll see belong to wolf spiders, red ones to geckos. Repetek, Turkmenistan These lizards are very delicate. If you hold them in a wrong way, they easily drop their tails and large pieces of skin. 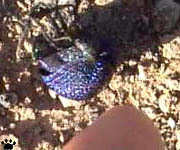 The tail immediately starts moving, producing loud noise with large scales on its upper side. Some deserts have surprising variety of amphibians. Common species of Chihuahua Desert, left to right: Couch spadefoot (Scaphiopus couchii), female and male; Chihuahuan gren toad (Bufo debilis), barking frog (Hylactophryne augusti). Nacori Chico, Sonora, Mexico. Most desert mammals are also nocturnal, especially carnivores, such as this hyena or wild cats. 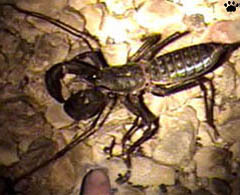 To see them, you have to hike for miles across the desert, searching with your flashlight for light-reflecting eyes. Sandy deserts are usually better than clay- or stones-covered. Culpeo Fox (Dusicuon culpaeus), Fray Jorje, Chile. Fennek fox (Vulpes zerda), Nizzana, Israel. In cold months, or after rains, carnivores can also appear at daytime, lured by abundant food: birds' nests, large insects, or frogs. Rodents are usually more easy to see, although some species - pigmy jerboas, kangaroo mice - are so shy that they emerge only in moonless nights. 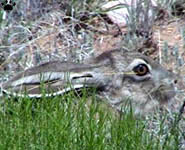 You can find them by sound or wait for them near burrows. 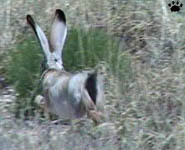 Black-tailed jackrabbit (Lepus californicus), Sevilleta NWR, New Mexico. Mojave Desert, California Being able to dig yourself a burrow is critical for desert survival. 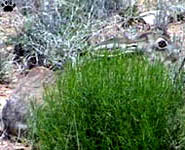 Burrow is not only a shelter from predators and extreme temperatures, it can be a comfortable place to live in. Some of the best builders can make so nice burrows, that many other species come to join them. Desert tortoises spend up to 10 months a year in their burrows, together with many reptiles, insects and other tenants. Sitting Bull Falls, New Mexico. Some desert creatures look a bit scary, but are harmless (like the one to the left), or peaceful unless provoked, like the one to the right. 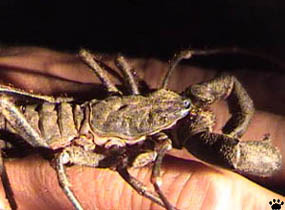 Giant vinegaroons grow up to 12 cm/5'. 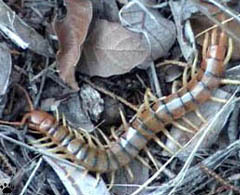 They can pinch you really hard, and spray vinegar acid from their "tails", but are not poisonous or aggressive. Water Canyon, New Mexico. Agadyr, Kazakhstan Spiders and scorpions are common in deserts, but usually you have to look for them to see any. Karakurt (left), the Asian relative of "black widow" of North America, is much feared - people die sometimes if being bitten by a female. Injected venom can be destroyed if you press a burning match to a bite within a minute from being bitten. Tarantulas look much more scary, but they are not dangerous. Fast-running blister beetles of genus Cysteodemus are protected from scorching desert sun by a layer of air under their inflated elaters. They look like rolling bubbles. Three Rivers, New Mexico. Sands, New Mexico. 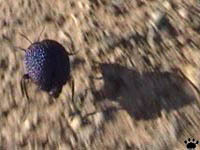 Insects are present even in the driest deserts, but most are nocturnal. Only various flies and darkling beetles are usually easy to find during the day. 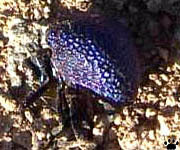 Eleodes beetles (right) are particularly common in many deserts and grasslands of the Northern hemisphere. 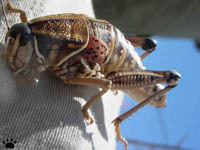 Assorted grasshoppers, Sevilleta National Wildlife Refuge, New Mexico.